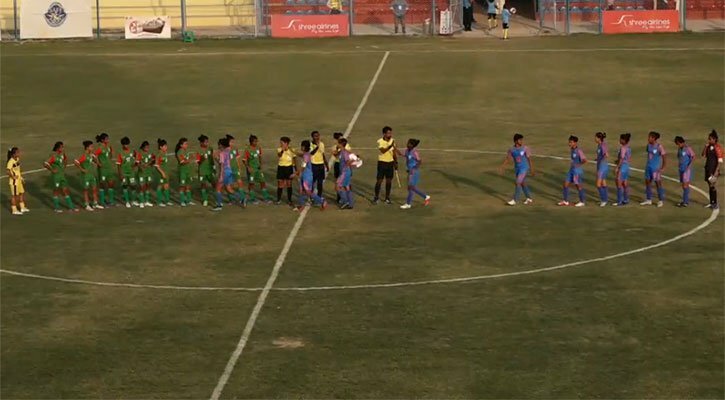 Bangladesh Women’s Football team suffered a humiliating 4-0 goals defeat against India in the semi-final clash of the six-nation SAFF Women’s Championship at the Shahid Rangashala in the Nepalese city of Biratnagar on Wednesday. India picked up the victory displaying dominance in all sections against Bangladesh. Bangladesh conceded three goals in the first half and one in the second half. The tournament’s 2nd semifinal between the two neighbouring nations kicked off at 3:15 pm (Bangladesh time) while hosts Nepal met Sri Lanka in the first semifinal at 11:15 am on the same day at the same venue.